We’d love your help. 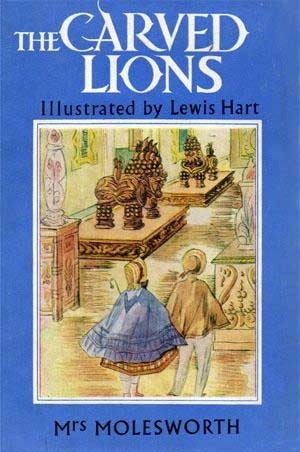 Let us know what’s wrong with this preview of The Carved Lions by Mrs. Molesworth. A story of orphans at a boarding school in England, and the fortunes and misfortunes that befall them. To ask other readers questions about The Carved Lions, please sign up. I found this book very hard to rate. It's a rather sad book, and for this reason I nearly didn't finish it. I hate sad books, though as a child, some of my favourite books were miserably sad. This one had me nearly in tears, which made me consider lopping off a star, but that's hardly fair is it. If a book can make you cry, it must have good writing behind it. Still, the sadness did drop my enjoyment level. Some of the other reviewers have commented that they couldn't relate to the main characte I found this book very hard to rate. It's a rather sad book, and for this reason I nearly didn't finish it. I hate sad books, though as a child, some of my favourite books were miserably sad. This one had me nearly in tears, which made me consider lopping off a star, but that's hardly fair is it. If a book can make you cry, it must have good writing behind it. Still, the sadness did drop my enjoyment level. Some of the other reviewers have commented that they couldn't relate to the main character and didn't even like her. I had the opposite problem, I could relate too much, hence the tears. I think I would have liked this book as a child, and for that reason I'm going with four stars. I was expecting a little more magic. A "nice" story - meh. There was nothing dreadfully wrong with this book. It was not overly didactic or moralistic - even though young Geraldine reads quite a few preachy books that were popular in the 1850’s. My main complaint against the book is that Geraldine is an unappealing heroine. As narrator, she makes too many excuses for herself and for the faults of others. All the mistakes she made in her school had to do with her being sick and not hearing well, or being naive and not responding well. She never seems quite real. Or likable. A sweet story, very standard, not much to it. This an audio book on LibriVox. Simple, charming, somewhat predictable story. A nine-year-old who is miserable at her boarding school runs away.